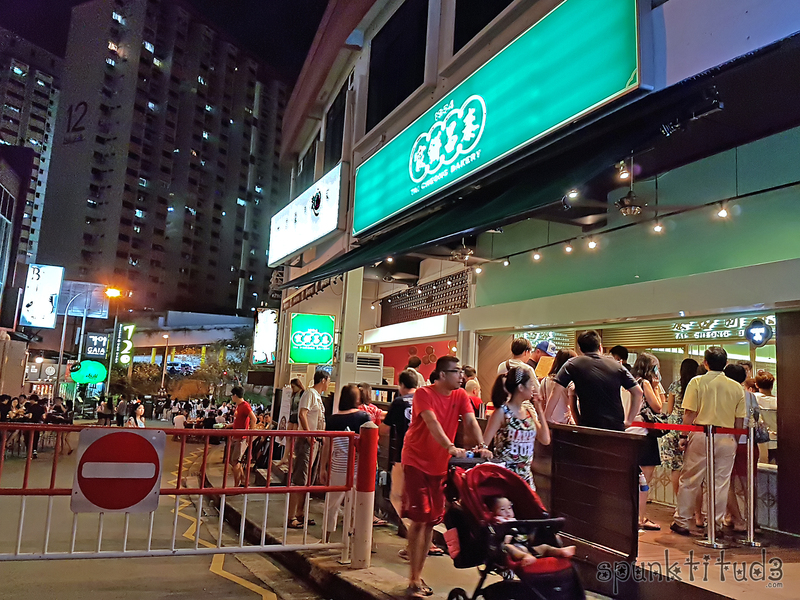 Tai Cheong Bakery, a Hong Kong brand known for its egg tarts, has opened its first Hong Kong-style cha chaan teng diner in Singapore. The diner at Holland Village comes after a series of pop-up stores and a takeaway counter at Takashimaya Food Hall. 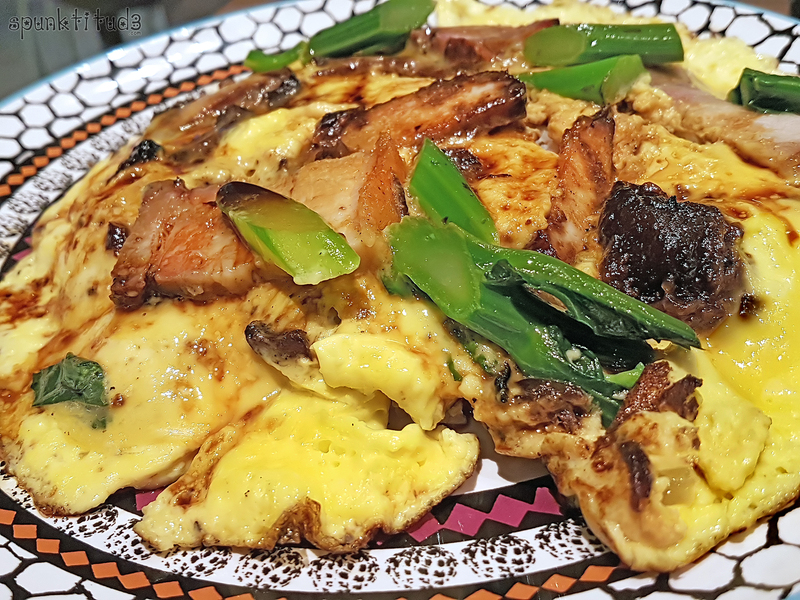 Diners can have a taste of Hong Kong with traditional cha chaan teng dishes at the 60-seat eatery located right in the heart of Holland Village. With already so many similar Hong Kong cafes in town, I was curious to find out if this one is as authentic. Cha chaan teng culture came about in the 1950s as a result of Hong Kong’s increasingly cosmopolitan and westernized middle class. Back in those days when Hong Kong was still a British colony, only high-class restaurants served western food and most of them did not welcome local Hong Kong people. After WWII, in a bid to end such discrimination, local Hong Kong people started to open their own restaurants called Cha Chaan Teng (translated into tea hall) serving affordable dishes combining elements of Western dining with unique Hong Kong flavours for people from all walks of life. Such cha chaan teng operate-around-the-clock serving a wide range of food at a breakneck pace to match Hong Kong’s busy lifestyle. 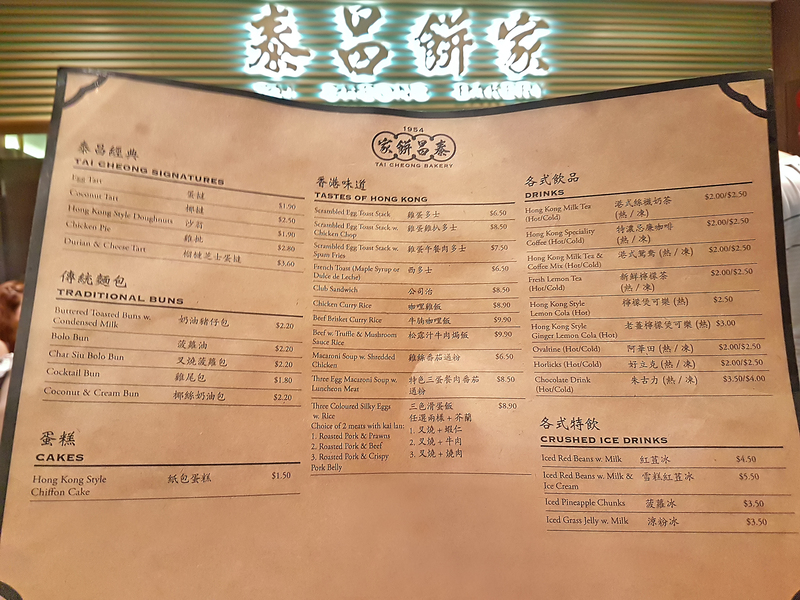 In fact, cha chaan teng is so much representative of Hong Kong that it was suggested that the humble local diner should be listed in the UNESCO Intangible Cultural Heritage List. For me, visiting a (non-touristy) cha chaan teng is a must whenever I go Hong Kong. 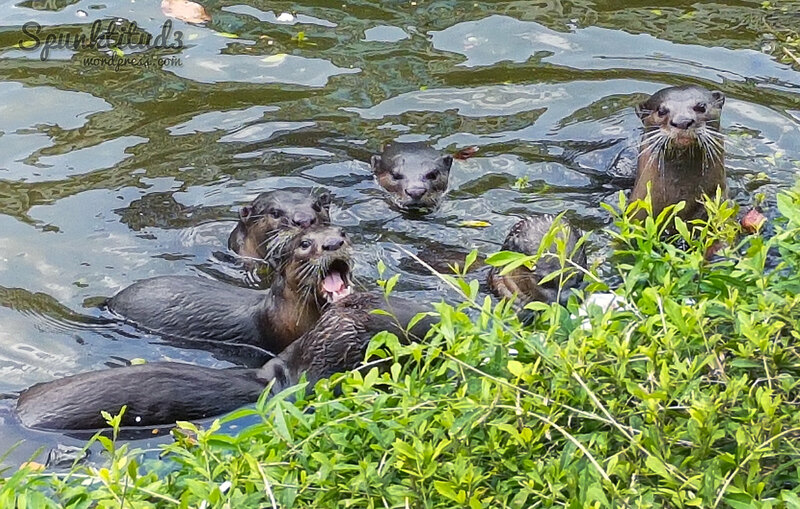 You learn to adapt to their pace and it’s the best way to experience the local culture. You get to share tables with the locals (tab toi), get scolded for hesitating over your order and overhear the latest gossip in the neighbourhood lol. Sometimes the waiters are the funniest bunch of people to talk to when they are not so busy. Tai Cheong Bakery will have a takeaway counter to sell its signature egg tart and other pastries, including a new durian and cheese tart specially created for Singapore and sold exclusively at the diner. Dine in customers can order up to 2 egg tarts per person and are not allowed to take away egg tarts. 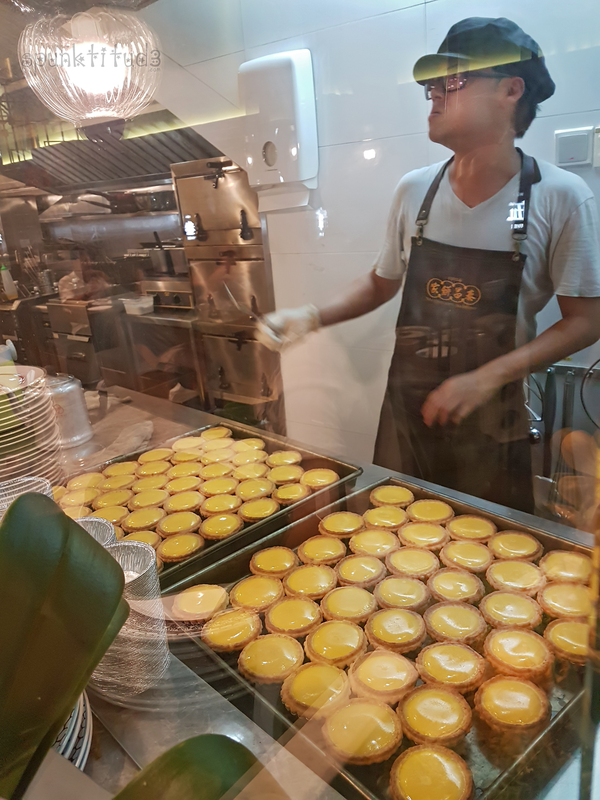 Customers at the takeaway counter may order up to 4 boxes/16 egg tarts. I visited the diner during its first opening weekend, and queued for about 45 minutes. You can give your name and mobile number to the staff, and the system will call your mobile once your table is ready. I chose to wait by the diner and feast my eyes on the menu. Piping hot egg tarts are the best! I always love eating them hot when the warm egg filling slides down your throat, and the crispy crust melts as your teeth sinks into it. We started out our meal with a coconut tart and an egg tart to share. The egg tart was up to expectation while the coconut tart was a disappointment – I tasted more flour than coconut. 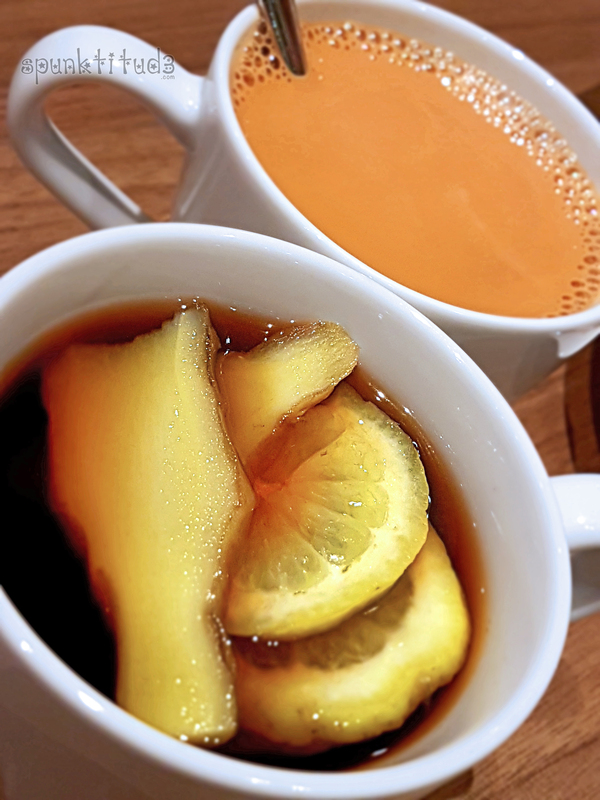 I loved my spicy cola boiled with lemon and ginger; it made me feel like I was in Hong Kong once again. The Hong Kong milk tea went terribly wrong though, it was tannic and didn’t taste anything like the Hong Kong tea we knew. Even after one packet of sugar the taste wasn’t right. The mains fared much better. We ordered the Three Colour Silky Egg with Rice (with roasted pork and crispy pork belly) after seeing it on many of the diners’ tables. The portion was huge. The curry fan in me initially wanted the Beef Brisket Curry Rice but decided against it after seeing the actual pitiful-looking dish being served. So, presentation does play an important part in whetting your guests’ appetite. 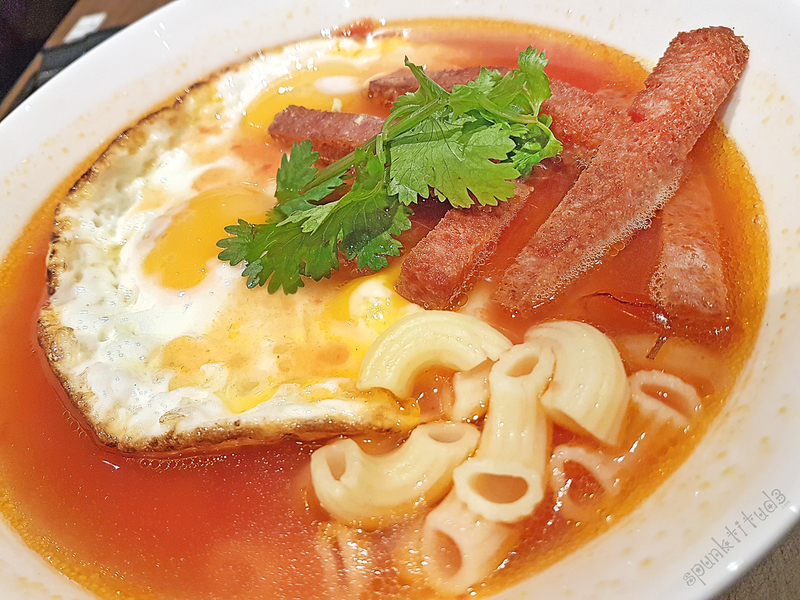 The Three Egg Macoroni Soup with Luncheon Meat was comfort food to me, though the luncheon meat strips were really salty. We were feeling a little ‘egged out’ by the end of our meal – almost every single dish had eggs in them so our cholesterol level must have shot up by quite a bit. Overall, it’s a nice casual place to hang out with friends, and I hope the downsides we had were just nuances of a newly-opened eatery. I would probably visit again if I am in the neighbourhood. 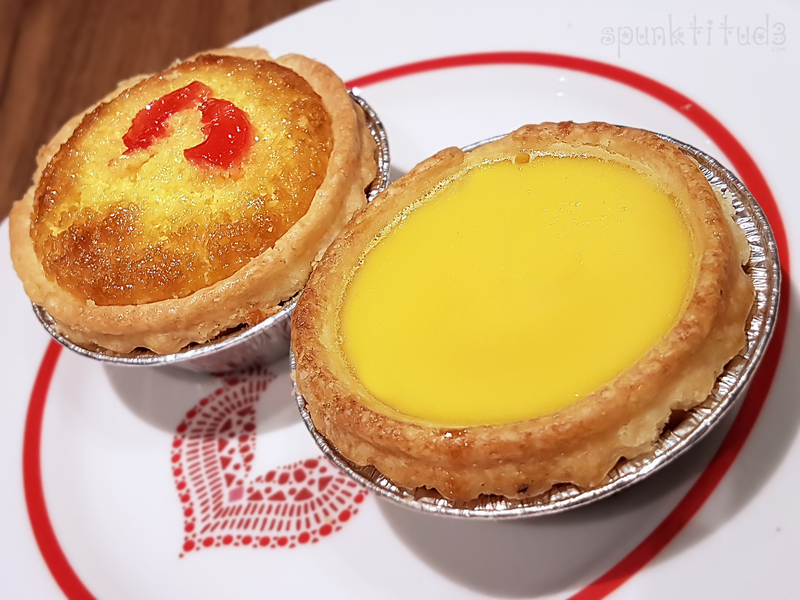 Categories: Food | Tags: best egg tarts, cafes in singapore, cha chaan teng, egg tarts, 茶餐厅, 茶餐廳, 荷兰村, 蛋挞, 香港美食, famous food, foodie, foodporn, holland village, hong kong cafe, hong kong diner, hong kong pastries, late night eats, singapore, Tai Cheong Bakery, tai cheong egg tarts, what to eat in singapore, 新加坡, 泰昌餅家 | Permalink. 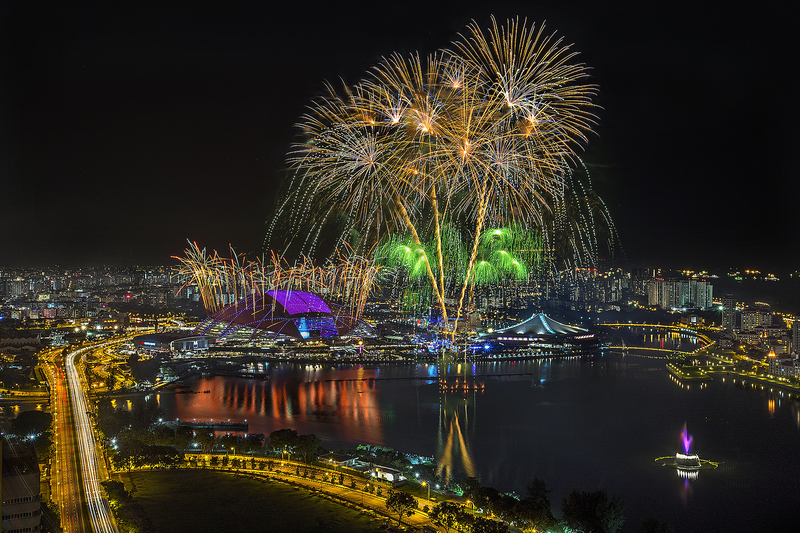 Categories: Event, Photography | Tags: シンガポール, bunga api, celebrations, 烟花, 煙花, Сингапур, 花火, feu d'artifice, fireworks, fuochi d'artificio, 싱가포르, landscape, night photography, фейерверк, photography, sea games, SEA GAmes 2015, singapore, Singapour, South East Asian Games, 新加坡 | Permalink. This Chinese New Year, I opted to skip the horrendous queue at Lim Chee Guan (a friend queued 6 hours) and try a different house of bak kwa (barbequed pork), one who doesn’t believe in making their customers queue for their candied meat (yes I am that extreme lol). 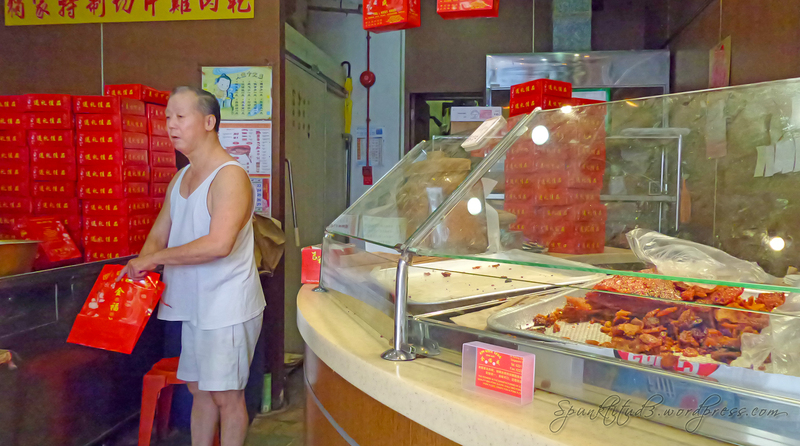 The shop is famous for its Original Barbecued Pork Slices and Bacon Bak Kwa (not available during Chinese New Year; I am so coming back to try this). Mr Ong encourages his customers to call and place an advance order at least three days before so they can just come to the shop to collect-and-go. His order chits stuck on the shop’s wall are so plenty they can masquerade as wallpaper. Traditional red boxes are piled high around the shop while trays of cooled bak kwa are ready to be packed for the next day’s orders. It’s definitely hard work, but Mr Ong is adamant about carrying on his craft for at least 10 more years. Expectedly, his 3 children have no intention to carry on the business. 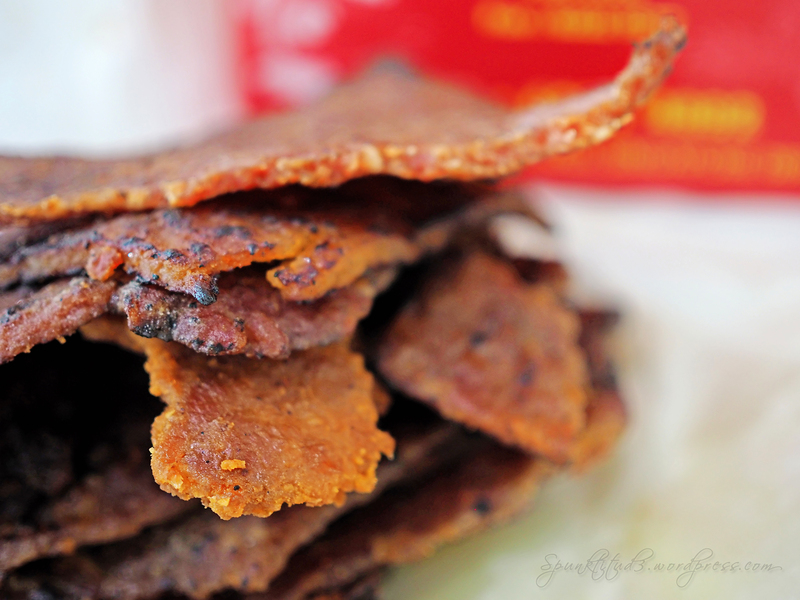 Kim Hock Seng’s bak kwa are less vibrant in colour and much thicker than those I have tried before, but they are tender to the bite with little fat. In fact, I meant to take the box of bak kwa out just to take one photo, but by the time I put it back, it was 500 grams lighter. In just 10 minutes. Oops. 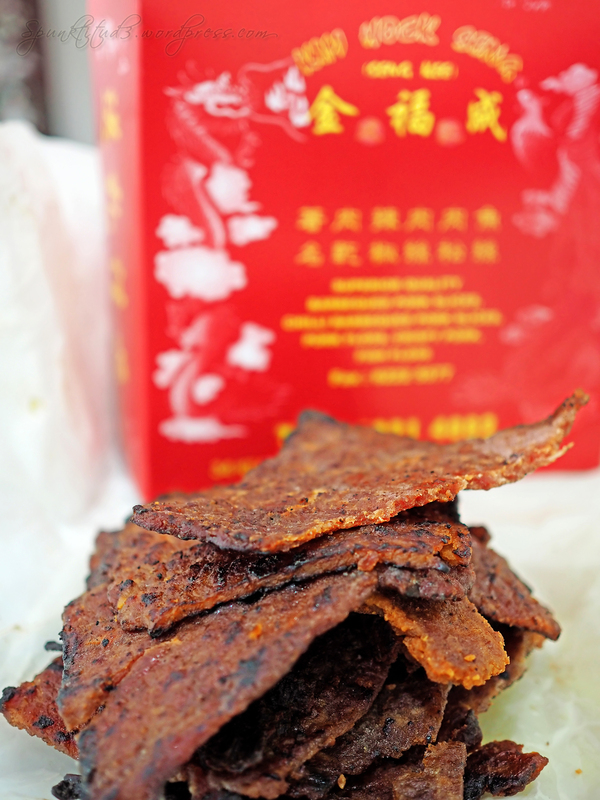 Categories: Food | Tags: Bak Kwa, best bak kwa in singapore, Chinese new year, culture, 肉干, 金福成, Kim Hock Seng, pork floss, singapore, tradition, 新加坡 | Permalink. 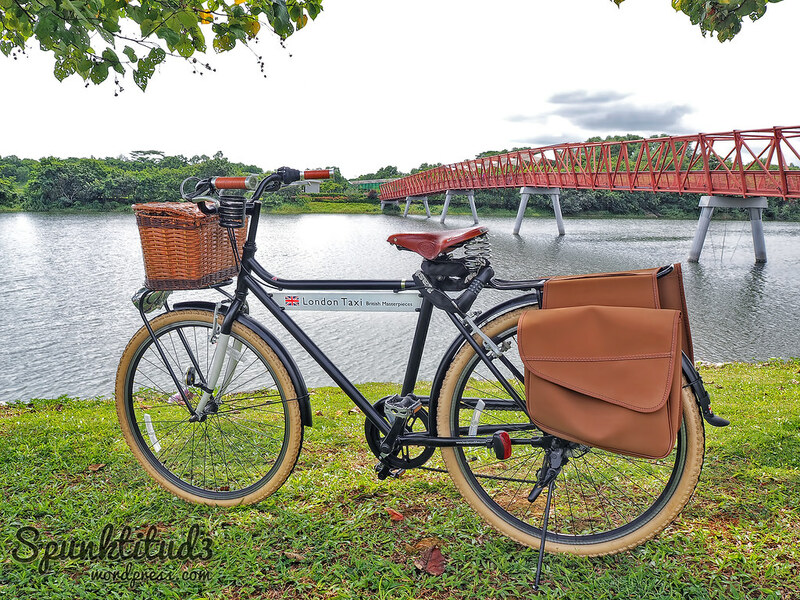 Categories: Fun, Photography | Tags: Bicycle, bike, brooks, cool bikes, Cycling, 脚踏车, 自行车, London Taxi, Lor Halus, nature, pannier, parks, recreation, retro bikes, singapore, vintage bikes, weekends, 复古, 新加坡 | Permalink.